I got into a conversation on Facebook about how I roast coffee and all the pluses and minuses. 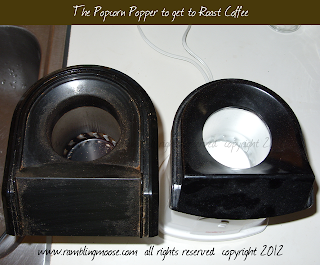 The one thing I wasn't getting across was the actual description of what to look for in a popcorn popper. Get a Poppery 2 air popcorn popper or another model that has a solid bottom to the corn hopper. Air vents must come in from the side so the air spins the coffee beans around. Use no more than 1/2 cup of beans per batch and you won't have to worry about any scorching or uneven roasts. Sure, that's the executive summary. What about the details? Check the picture at the right. I got the one on the left at a thrift store for $6, the new one on the right for $5. They both work fine and are made by different companies. Specifically, I put 1/2 cup of unroasted "Green Coffee Beans" into the hopper, replace the shield, plug the thing in and wait for 6 minutes 15 for decaf, 6 minutes 30 for regular - depending on the house temperature. If you're doing it outside to save your house from smelling like coffee permanently (mine does now), you will have to judge. I keep my house at 76F (I'm in Florida), and in winter I have to roast a little longer because on a cold day, the heater is set for 69F. Brr. If you never thought that 69F (that's 20.5 C) is cold, move to Florida. The second year you're here you will. How's that Karyna and Emilio? Did the picture help? Now if you want more details, check my blog for any "coffee" articles by searching the tags.